This weeks guest blog come from Penny Bond, Improvement Support Team Leader in Healthcare Improvement Scotland leading a national programme of work to improve older people’s acute care @opachis. Here she talks about a collaborative national approach to improving the identification and management of delirium in older people admitted to acute hospitals. Delirium is a serious medical emergency affecting up to 25% of hospital inpatients. This figure is even higher in individuals having surgery or receiving intensive or palliative care. It is associated with poor outcomes, is more prevalent in older people admitted to hospital and the risk of developing delirium is greatly increased in people living with dementia. Despite its prevalence and impact delirium is not always reliably identified or well managed. Improving the identification and management of delirium has been and continues to be a key area of focus for Healthcare Improvement Scotland’s (HIS) improving older people’s acute care programme since April 2012. Colleagues across Scotland including the Scottish Delirium Association and Alzheimer Nurse/AHP consultants have worked collaboratively to take this work forward. Although delirium and dementia are different evidence tells us that an existing dementia can significantly increase the risk of developing delirium. Conversely people with delirium are more likely to suffer further cognitive decline including dementia. Delirium is very distressing to individuals and to their families and carers. It is vital that staff are aware of the connection between the two as well as understanding the difference between them. One of the factors differentiating delirium from dementia is its sudden onset. When family members use expressions like “This is not my Mum” or “I don’t recognise Dad” it should serve as a trigger for thinking about the possibility of delirium. People who develop delirium stay two or three times longer in hospital and are also more at risk of hospital-acquired complications, such as falls and pressure ulcers, are more likely to be admitted to long term care, and have an increased mortality. Not all episodes of delirium are avoidable but there is evidence to suggest that about a third of deliriums are preventable. Some of the risk factors that can be reduced include dehydration, constipation, multiple medications, infection and sensory impairment. In response to requests from clinical teams we worked closely with the Scottish Delirium Association and other colleagues across Scotland including Alzheimer Nurse and AHP Consultants to design, test and adapt a range of tools and resources to help assess, manage and review delirium. The two main tools that have been tested are the 4AT assessment tool and the ‘TIME’ bundle. The 4AT has been shown to be a straightforward and effective means of screening for delirium. When a possible delirium is identified the ‘TIME’ delirium care bundle provides a guide for staff to think about possible triggers for the delirium, any investigations that may be needed, how to manage care effectively and crucially highlights the importance of engaging with families and carers. The value of listening to family members can’t be under estimated and patient and carer experience of delirium have informed tools and resources. Providing staff with education on delirium can contribute to early recognition of delirium in older people. 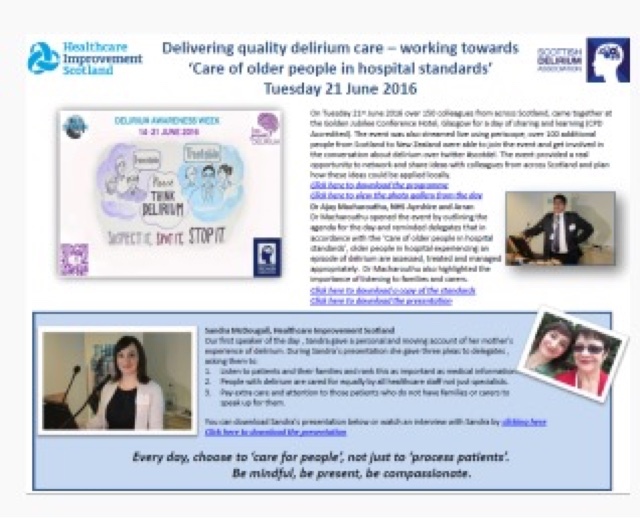 Colleagues at NHS Education for Scotland developed a range of learning resources to support staff and enhance their knowledge and understanding of delirium. Two modules are available on Learnpro (http://nhs.learnprouk.com). The first module ‘An Introduction to Delirium’ provides baseline knowledge and skills for all staff working in health and social care settings while the second module ‘Delirium: Prevention, Management and Support’ aims to enhance the knowledge and skills of health care professionals working across all care sectors. Benefits of adopting a national approach to improving delirium care include the creation of opportunities for networking and sharing new knowledge and experience across Scotland and learning from each other. Awareness of delirium has increased and there is evidence of more reliable and consistent processes in delirium screening. The programme has facilitated collaborative working between teams and across Scotland. The improvement focus of HIS, the subject matter knowledge of clinical colleagues, the lived experience of families and the commitment and engagement of local teams have all served to augment these benefits. With an ageing population generally and rising numbers of older people with dementia admitted to hospital as an emergency caring for older people is ‘core business’ for hospitals. We will continue to work with colleagues across Scotland to ensure a consistent and person-centred approach to the improvement of delirium care for all older people in acute care.